I have been waiting for this for a long time because there was a time ago that i mentioned with technology everything will become easy gradually gradually, imagine the world in 2030. Today MTN introduced 5 different whatsapp numbers to reach them online and solve all your enquiries with them at the palm of your hand not minding to waste some series of hours to call them. 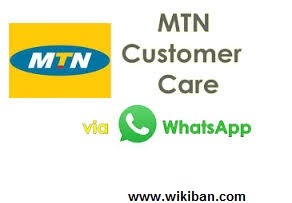 Recently i published a post on how to chat with them online but i think the most easiest and safest way has emerged by saving there number on your contact and disturb them whenever you are not satisfied with the service. The numbers available at the time of this post is just only 5 and i believe we will still anticipate for more numbers to be online because 5 will not assist millions of online users in a bit. Just select anyone among the above numbers and save it on your whatsapp list. that all enjoy, we are still waiting for other networks to join them soon.